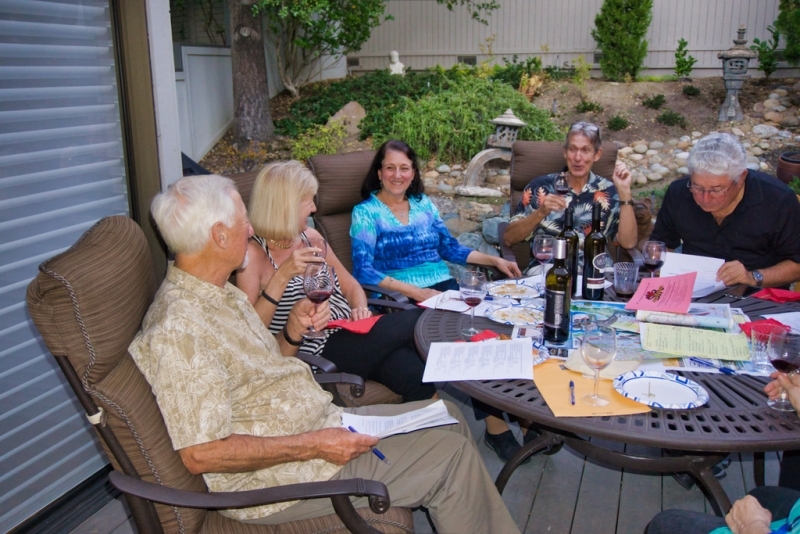 The SIR ALL ABOUT WINE GROUP consists of 14 members with emphasis on regularly scheduled social events related to gaining the appreciation of fine wines, learning about wine regions of the world and vinifera wine varietals. Events are held every two months, generally on the second or third Thursday of the month, 6:30pm to 8:30pm. The location for each event rotates among the homes of the regular members. This is a coed activity. Regular members and guest participants, in case regular member(s) are not able to attend a particular event, should have some previous knowledge pertaining to wines. Wines for each event adhere to a theme, as region, country of origin, type, varietal, etc. These are selected and obtained by the chairman and are generally in the price range of $16 to $45 retail price for a 750ml bottle. The minimum number of bottles is one bottle to share with 5 to 6 people with emphasis on red wines, but to also included white and/ or rose’ depending on the wine theme for the event. All participants share in the cost of the wines and are required to bring a food-quality appetizer plate, enough to share with 5 to people. The shared cost of the wines is intended to be in the range of $14-$20 per person. Other activities, as guest speakers, home winemaking, daytime meeting at winery locations, wine retailers, etc. are planned. Dec. 13, 2018. This date is planned for our First Annual “Potluck Dinner and Wine” event. The planning is nearly complete on this Dec. 1 date. All 7-members/14 persons total will attend and the food choice to bring has been done. I will confirm all today or tomorrow. 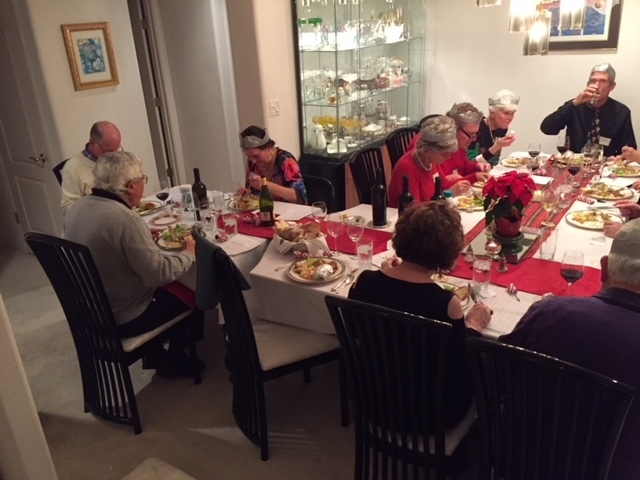 On Thursday evening, December 13, 2108 the seven members of the SIR All About Wine activity group enjoyed a festive meal,” HOLIDAY POTLUCK”, at the home of Ed and Vicky Kirschner. The evening began by watching the final phase of the sunset from their deck looking to the west from this vantage point high up the slopes of Mt. Diablo in Alamo. The appetizer course included a couple of bottles of an Albarino white wine from a Lodi, CA winery and a Gewurztraminer from a Michigan winery. 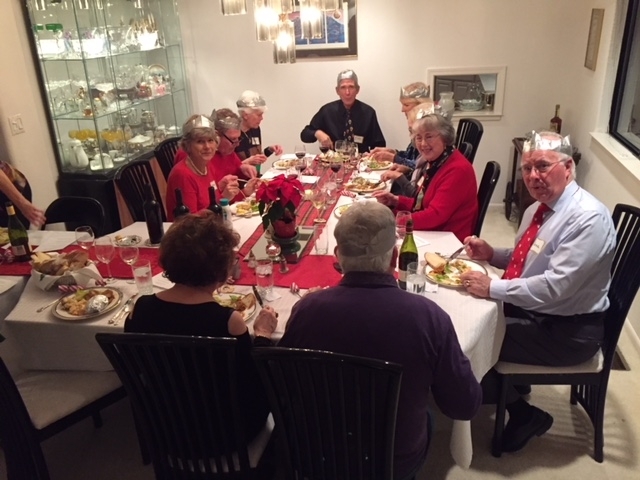 All then gathered a full plate of food and found places at the dinner tables which were arranged cleverly so all persons were together in one room. Thanks Ed and Vicky for your efforts to make this happen. The host provided the main meal item – Surf & Turf – with salmon and brisket steak. The other members brought their chosen items of salad, bread/rolls, a vegetable casserole of broccoli/cauliflower, baked Russet potato, followed by a couple of desserts. Wine pairings included Sonoma –Cutrer Chardonnay and Pinot Noir, Klinker Brick-Lodi Cabernet Sauvignon and Zinfandel for the meal. The two desserts were paired with a homemade Sherry and homemade Port from Tom and Barbara Anders. 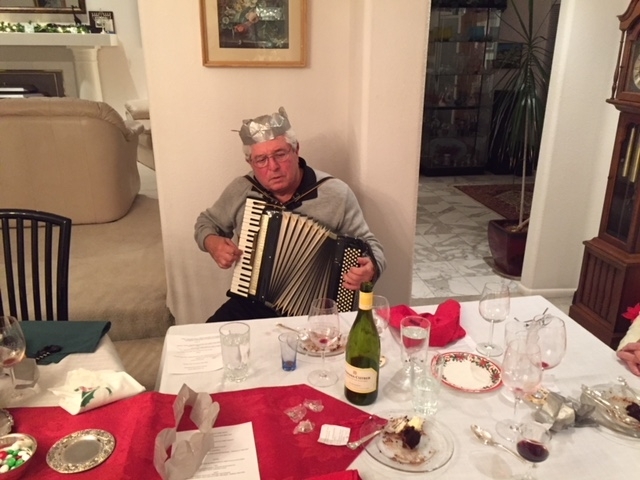 Our host, Ed Kirschner, then announced that during his younger years he played the accordion to gain money for schooling, etc. but now had not played for several years. You would not believe this as he now led us in singing by playing “by ear” many traditional Christmas and Holiday songs. All had a great time. Our group met at the home of Derek and Pauline Southern for a late afternoon gathering to enjoy wines of Michigan along with delicious appetizers. The outside patio venue provided a perfect setting. This was the first time for a wine theme featuring vinifera (European grape varietals) wines from a USA state quite unknown by the group for such wines. All were quite surprised by the quality and each wine was appreciated by everyone. Whites: Bowers Harbor Vnyds. 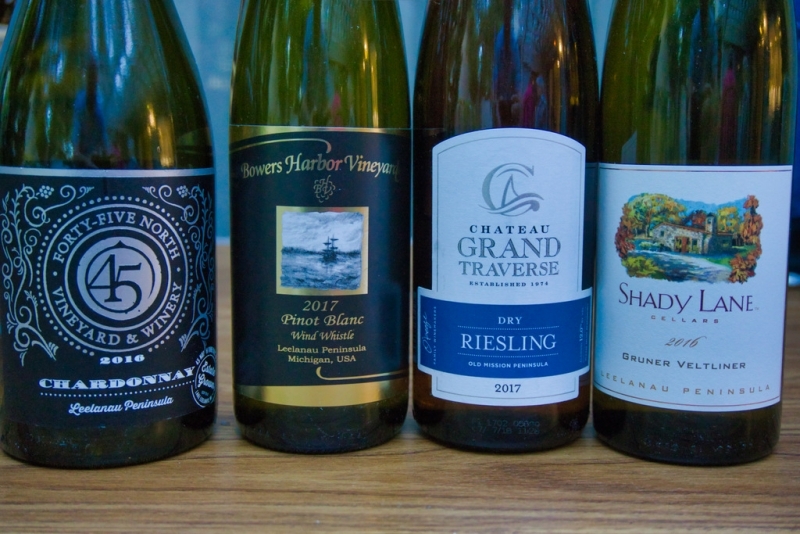 2107 Pinot Blanc (First Choice White Winner); Chateau Grand Traverse 2017 Dry Riesling(2nd); Shady Lane Winery 2016 Gruner Veltliner(3 rd ). Bel Lago Vnyd; 45 North Winery 2016 Chardonnay. As this was a success we will do another Michigan wine theme event with a different assortment of wines(most already collected). Also, future events will include events of vinifera wines from New York State-Finger Lakes(already collected); Virginia(already collected), and plan for North Carolina, and Texas. Requirement is that the grapes must be from the estate or grown locally. The AAWG next meeting is planned for Dec. 13th or 14th and will be a Christmas dinner event pairing the wines with the meal items. Wine theme is expected to be “Wines of Lodi AVA”. Aug 16, 2018. 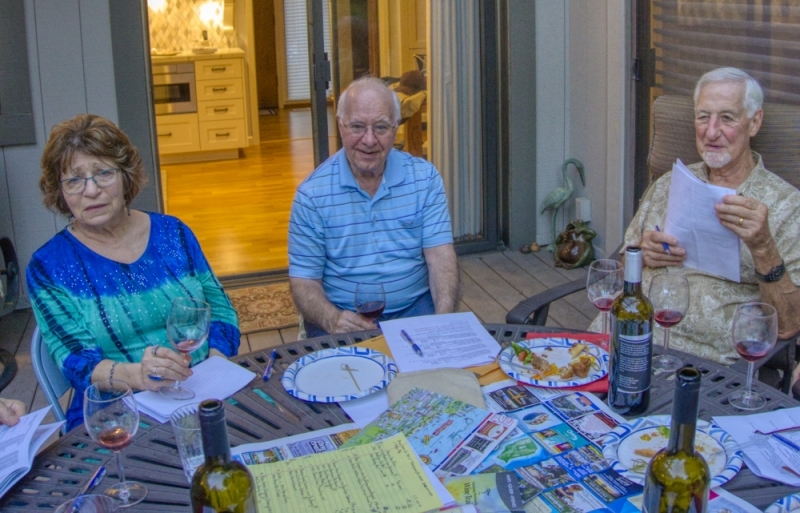 Attempting to have one more summer event to take advantage of the good late afternoon/early evening weather the All About Wine Group enjoyed an outside venue event on the patio of the Clayton home of Dan and Helene Casella. 12 members were able to join the festivities featuring another usually lighter-style red wine varietal – SANGIOVESE/CHIANTI(ITALY). CHIANTI, the name exclusive to Italy, is a wine made with a minimum of 75% Italian Tuscany-region Sangiovese grapes. USA producers use the varietal name SANGIOVESE to label these wines which they produce from their estate or regional USA grapes. Three Chiantis, price range $18 – $22, and four Sangioveses: Vino Noceto(Amador Co.), Stolpman Vnyds. (Santa Barbara Co.), Luna Vnyds. (Napa Valley), and Silverado Vnyds. (Napa Valley) were presented. 1st Choice was a tie with the Vino Noceto and Stolpman wines, 2nd Choice was Luna and 3rd Choice a tie with Silverado and Tenuta Di Nozzole(Italy). July 12, 2018. 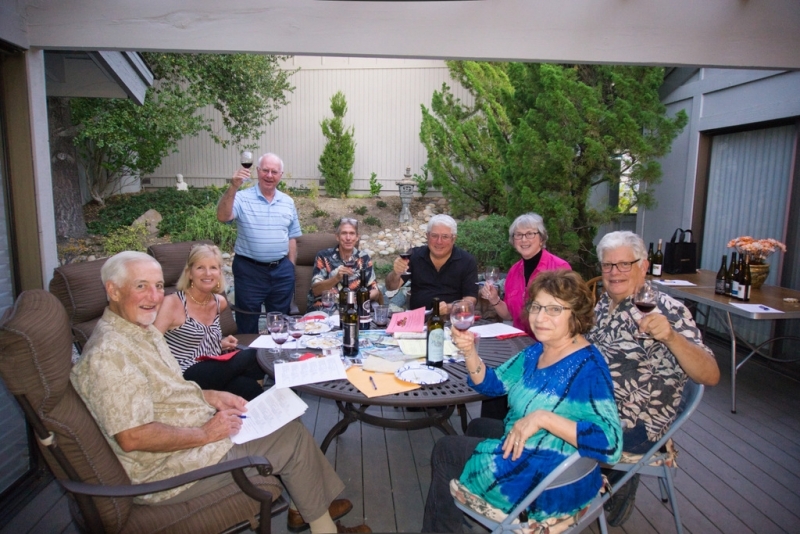 A group of 17 members came to this event which featured nine PINOT NOIR wines. Appetizer speciality was a large grilled salmon to compliment the wine theme. The outside venue at the home of Bill and Beverly McCallum in Walnut Creek along with a perfect weather day added to this early evening event. The wines included some older vintages as; 2001 Oregon Domaine Drouhin, 2003 Mt. Rose Station, South Island New Zealand, 2006 Goldneye (Duckhorn V.) Mendocino Coast. The one that held up best and took 2nd Choice was the Goldeneye. 1st Choice was 2015 Adelaida Cellars, Paso Robles AVA, and 3rd Choice Baileyana 2014 El Pico Vnyd. (Edna Valley, San Luis Obispo AVA). May 17, 2018. 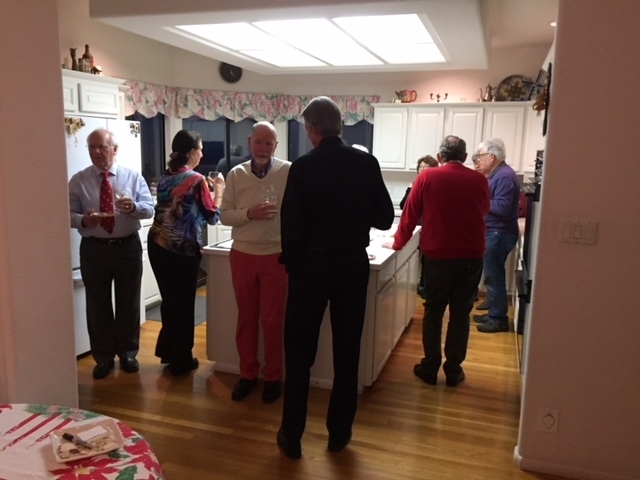 A group of 14 members of the AAWG gathered at the modern apartment home of Bill and Daniela O’Donnell in the very center of downtown Danville. 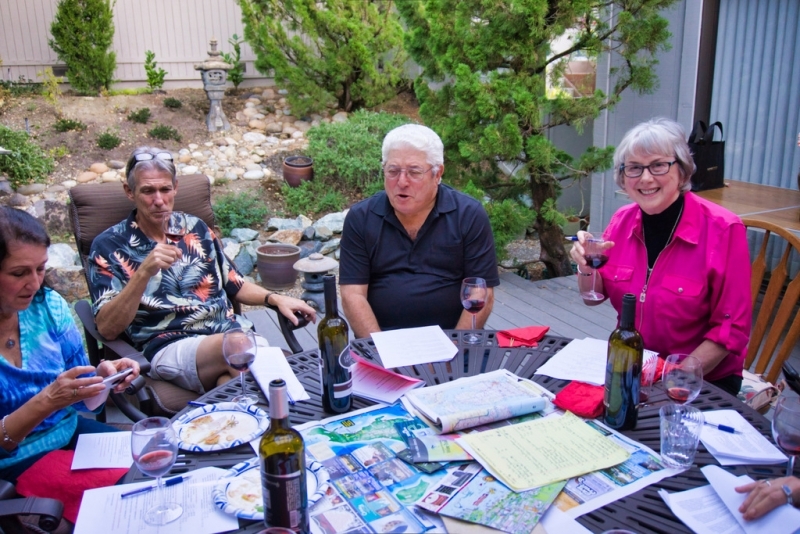 The late sunny afternoon gathering on their spacious outside patio created a venue for socializing and enjoyment of the delicious appetizers along with wines of “Sonoma and Mendocino Counties”. Thanks especially to David and Linda Bushnell for their warm Brazilian cheese puffs. These went well with the Roederer BRUT CALIFORNIA CHAMPAGNE(Mendocino) served from a magnum bottle – one of the featured White Wines. The Sparkling Wine was the eventual 1st Choice White and a Chardonnay from Benzinger Family Winery and a Pinot Gris from Handley(Mendocino) were judged nearly equal for 2nd Choice Whites. The favorite Red Wine was a 2014 Cabernet Sauvignon from Stonestreet Winery, Alexander Valley and 2nd Choice Red a PINOT NOIR from Goldeneye-Duckhorn(Mendocino). Other red wines included ZINFANDELS from Carlisle, Novy and Ridge-Lyton Springs. April 12, 2018. For $17ea. and bringing a hearty appetizer the large group of 19 participants was able to taste and judge some of Sonoma Counties best wines. The hosts, Jim and Debbie Sawin shared their large home with us giving us views up the slopes of Mt. Diablo and across their Chardonnay vineyard with its resident 22 year old, 80lbs. tortoise. 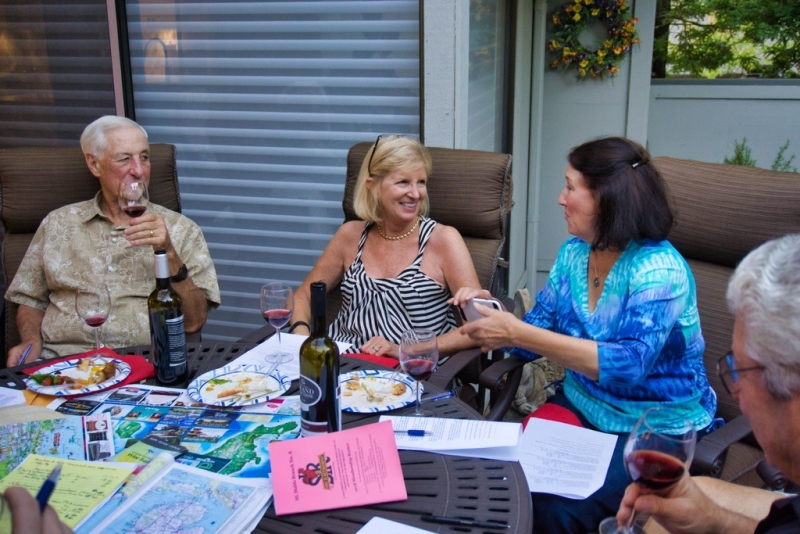 Enjoying some of Jim’s skillfully-made homemade wines was an added pleasure for all. 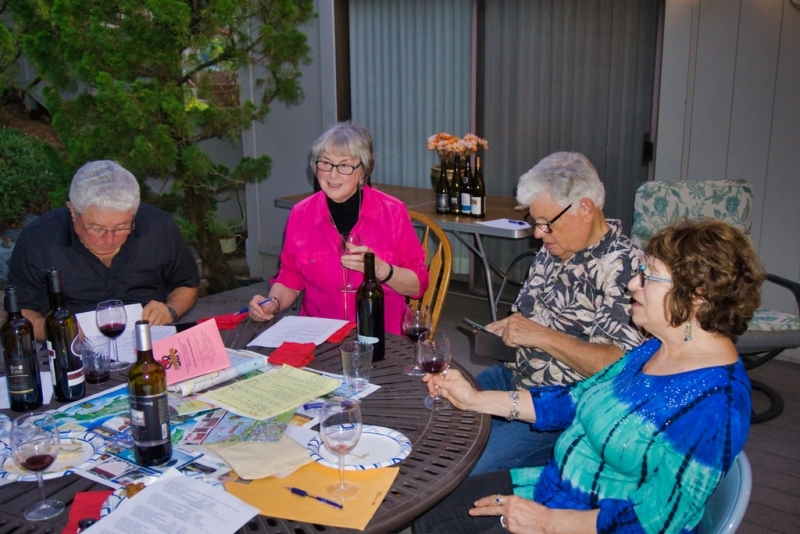 The wine theme for this event was “Sonoma County Wines, emphasis Bordeaux Varietal Reds”. The two white wines, Sonoma Cutrer CHARDONNAY and Dry Creek Vnyds. FUME’ BLANC, rated nearly equal as the top Choice White Wines. A Kokomo Winery ZINFANDEL and a CABERNET SAUVIGNON from Benzinger Family rated 1st and 2nd Choice for the Reds. Other Red Wines included: MALBEC, PETIT VERDOT, another CABERNET SAUVIGNON, and a CABERNET FRANC. Feb. 15, 2018. 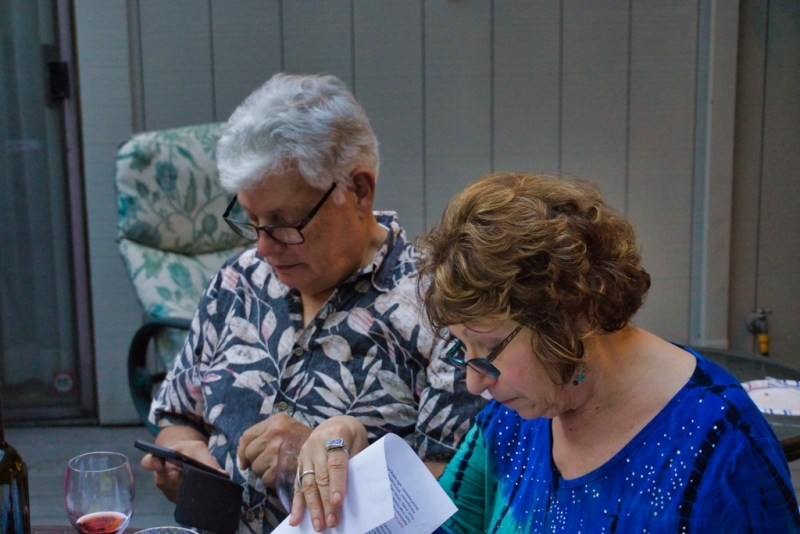 14 members of the AAWG got together at the home of Tom and Barbara Anders for an evening of wine tasting, socializing and with a special guest speaker, Dr. John Bristow. Dentist, John Bristow is an avid home winemaker and WINE JUDGE. He was with us to teach us about judging wines. The wine theme for the evening was “Southern Rhone Valley Varietals Produced by West USA Wineries”. A couple of wines from Maui, Hawaii – a Syrah and a Rose’, Syrah/Grenache Blend, and a Syrah made by Dr. Bristow at his home winery building in Benecia were included. The judging results show the 1st Choice red wine to be Dr. John Bristow’s Syrah. 2nd Choice – 2015 GRENACHE, Lewis Grace Winery, El Dorado County, Sierra Foothills. Dr. Bristow told me he had heard about this wine as it received a 98pts. score from a recent San Francisco Chronicle judging. He also told me later that he had phoned the winery and ordered a case to ship to his home. Also well received were a Miraflores Winery SYRAH, a MOUVEDRE from Andrew Murray, Santa Barbara County. The Rose’ and a Viognier from Santa Maria Valley were somewhat lost in the enthusiasm for the red wines. The appetizers brought by the members were GREAT!!! Dec. 15, 2017. AAWG ended the year 2017 with an evening event featuring guest speaker Don Brady, Winemaker of Robert Hall Winery, Paso Robles. The wines presented were Robert Hall and Brady wines along with a selection of six noted wines from wineries of the San Luis County/Paso Robles AVA collected by Tom Anders with the assistance of Don Brady during a recent trip to the region. The Robert Hall Wines and Brady Family Wines were well received by the group of 14 members. The remaining six wines included a VIOGNIER, PINOT NOIR, CABERNET SAUVIGNON, ZINFANDEL, SYRAH, and a PETITE SIRAH. The Zinfandel from J Dusi Wines was the 1st Choice and Pinot Noir from Adelaida Vineyards and Winery came in as 2nd Choice.